The whole world will soon be instantly at Steve Roberts’ fingertips. Much of the world already is. From the high-tech nomad’s perch on an 8-foot-long bike, Roberts talks with ham radio operators, types stories into a computer and can phone home or most anywhere with his cellular phone. For Roberts and his girlfriend, Maggie Victor, home and work is where the “Winnebiko” is. The combined bicycle-computer-ham radio is Roberts’ answer to the confines of suburban life. “I got tired of the three-bedroom ranch in Columbus, Ohio,” he said. 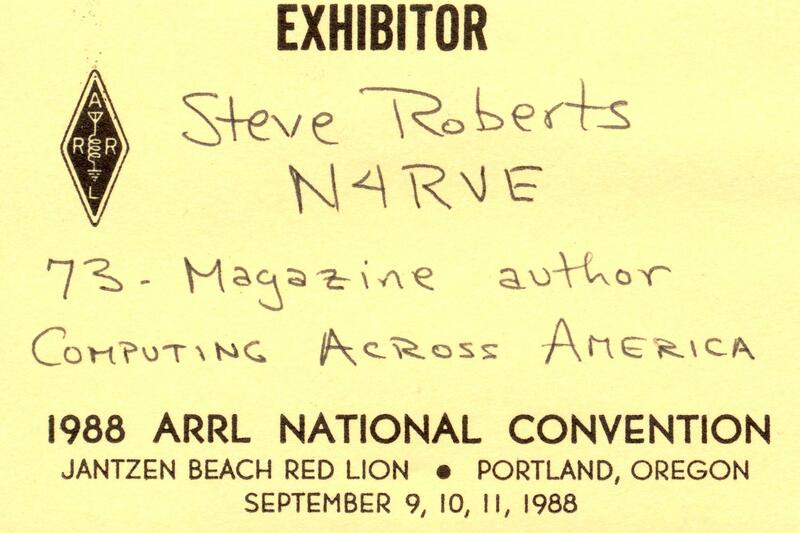 So six years ago, Roberts took his free-lance writing and computer skills on the road in his mobile communication contraption. Powered by 10-watt solar panels and programmed with a sense of humor, the Winnebiko has become a celebrity attraction across the country. “Are there life forms nearby?” the bike’s computer asks. Yes, every where it goes, people stare. Since he started his nomadic lifestyle, Roberts has pedaled 16,000 miles, written a book on the first 10,000 miles, become a regular columnist for a ham radio magazine, fallen in love and convinced his girlfriend to join him. When he isn’t explaining the contraption to gawkers, he writes articles on a variety of subjects, ranging from computers to cycling. 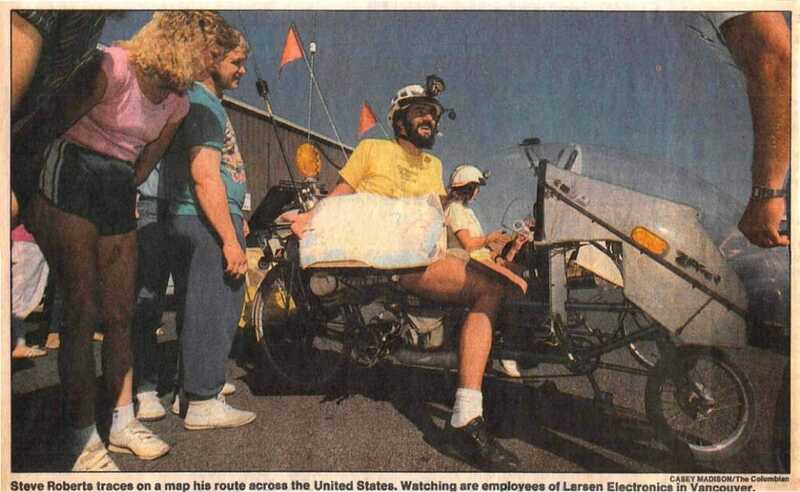 In town for a ham radio operators’ conference at the Jantzen Beach Red Lion this weekend, he demonstrated the bike Thursday at Larsen Electronics in Vancouver. The company, which manufacturers the antennae Roberts uses for his ham radio and cellular phone, is one of 90 equipment sponsors of the Winnebiko. “I can see how it works technically. The whole thing together is remarkable,” said Larsen’s vice president of marketing, John Beamon. 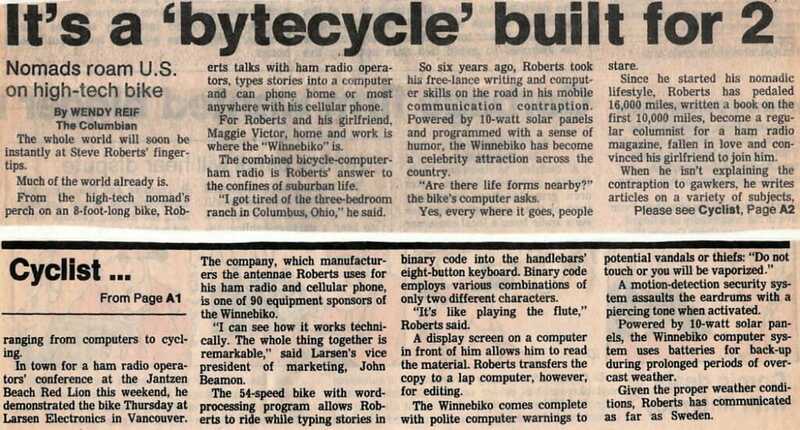 The 54-speed bike with word-processing program allows Roberts to ride while typing stories in binary code into the handlebars’ eight-button keyboard. Binary code employs various combinations of only two different characters. “It’s like playing the flute,” Roberts said. A display screen on a computer in front of him allows him to read the material. Roberts transfers the copy to a lap computer, however, for editing. A motion-detection security system assaults the eardrums with a piercing tone when activated. Powered by 10-watt solar panels, the Winnebiko computer system uses batteries for back-up during prolonged periods of overcast weather. Given the proper weather conditions, Roberts has communicated as far as Sweden.